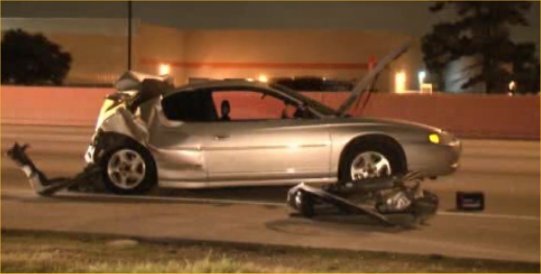 A pickup truck rear-ended a Chevrolet Monte Carlo at 9:45 p.m. last night, Thursday May 30th, killing the driver of the Monte Carlo and injuring his female passenger. 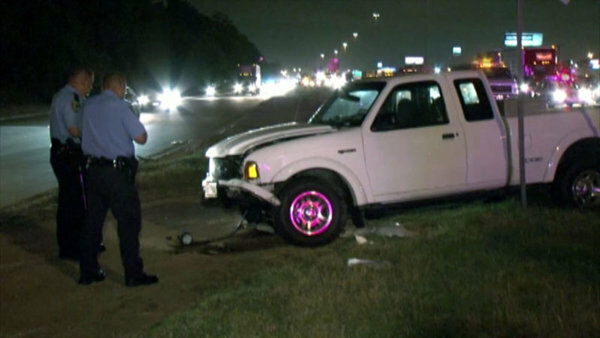 According to Channel 2 News Houston, the Monte Carlo and the pickup truck were both heading westbound on the North 610 Loop when the pickup struck the car, causing major rear-end damage. As the photograph shows, the trunk of the Monte Carlo is completely collapsed. The driver and passenger of the Monte Carlo were both trapped inside the vehicle, probably because the rear-end impact pushed the rear panels forward jamming shut the driver and passenger doors. The driver of the Monte Carlo was taken to the hospital where he died. Police say the pickup truck driver was not intoxicated at the time of the crash and no charges are anticipated. 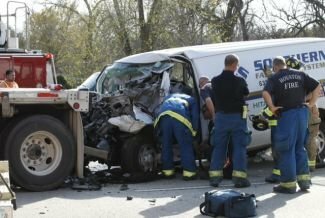 Local media outlets are reporting a person was killed in a rear end accident involving a white van and an 18 wheeler on the North Loop near Jensen Thursday afternoon. At around 3:30 p.m. the van hit the rear of an 18 wheeler in the eastbound lanes. The van, apparently a commercial vehicle, sustained massive front end damage in the crash. 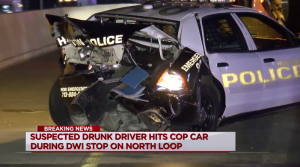 Lanes were closed for several hours as Houston police investigated the cause of the accident. Two media outlets, the Chronicle and Channel 13, report that a person was injured rather than this being a fatality. A woman riding an adult-sized tricycle was struck and injured by a hit-and-run driver early this morning. At around 4:15 a.m. the lady was riding near the North Loop at Eastman in Houston when an unknown vehicle hit her: the driver fled the scene instead of sticking around to render aid. The woman was transported to hospital in stable condition. If you have any information on the identity of the hit-and-run driver, call HPD’s non-emergency number at 713-884-3131. Channel 11’s story is here.